Samsung is making some lofty claims about their new monitors. 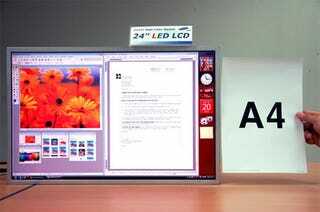 Debuting in Q2, their new 24-inch LED-backlit monitor will offer color quality that rivals that of their best TVs. The monitors, which will support WUXGA resolutions, will attempt to max out every spec possible, carrying the widest viewing angles (180 degrees) at the highest contrast ratio available (1,000:1) for a computer monitor. Pricing isn't set in stone, but we bet these pro monitors won't come cheap.